My Mom is Magical Launch Party at Pippa & Co.
What better way to celebrate the launch of our newest book My Mom is Magical than with a party? 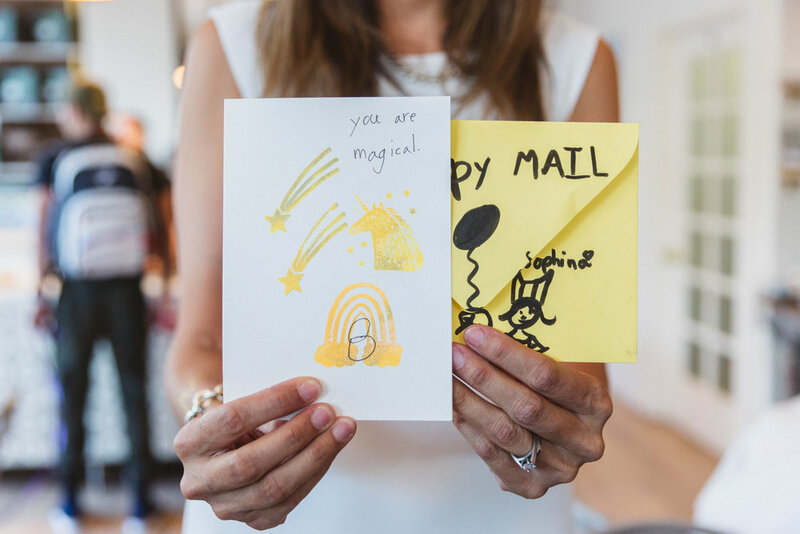 Last weekend in collaboration with Pippa & Co. and Daydream Society we celebrated magical moms with a number of friends, family, and guests. The party had a temporary tattoo station, delicious treats from XO Bakes, and tons of themed coloring pages. Not to mention being in the gorgeous Pippa & Co. space. Plus Eunice and Sabrina Moyle hosted a story time! Thanks again to Pippa & Co. and Daydream Society for coming together on such a wonderful event! Missed this one? You're in luck! We're having another launch party Saturday, May 12th at Tantrum in San Francisco. Check out the Facebook event for all the details. We’re bringing our sunny and punny illustrations and our favorite mythical creatures to a new medium… children’s books! My Mom is Magical (available now) and its sequel, My Dad is Amazing (coming soon) are our favorite new Hello!Lucky products! And look out, because soon, we’ll have our corresponding cards on our letterpress site! We love the fact that children’s books usually teach simple but profound life lessons. Often these are the basic things that we forget as we grow up—things like being kind and caring—but that are key to leading a happy, fulfilled life. It is so much fun to revisit these ideas through the eyes of children! Children and parents both benefit from reading them. We also love that children’s books have to be both entertaining and emotionally true to keep a child coming back to read it again and again. It’s a super-fun challenge to come up with ideas that are fresh, inspiring, funny, and deep at the same time. Find out where to get your own copy here! 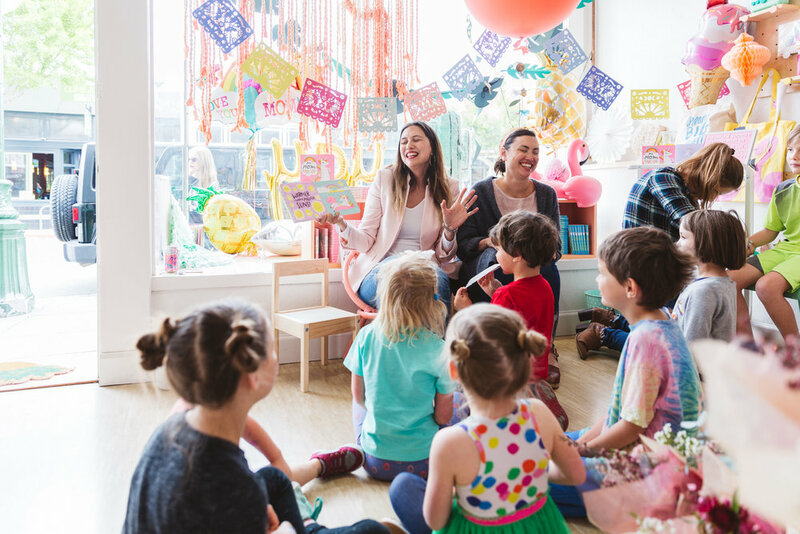 If you're local to the Bay Area, we'd love to catch you at one of our two My Mom is Magical events! Save the dates- May 5th @ Pippa & Co in Berkeley 1-3pm, and May 12th at Tantrum in Richmond 12pm-2pm. Hey letter-writing lovers! It’s April, which means it’s our favorite time of the year, National Letter Writing Month has arrived! It's time to start the Write_On 30 Day Challenge! We'll be sharing all kinds of inspiration all month long on the Write_On blog and on Instagram, so keep your eyes peeled! Our official 2018 Write_On Letter Writer Kits are a great place to start! 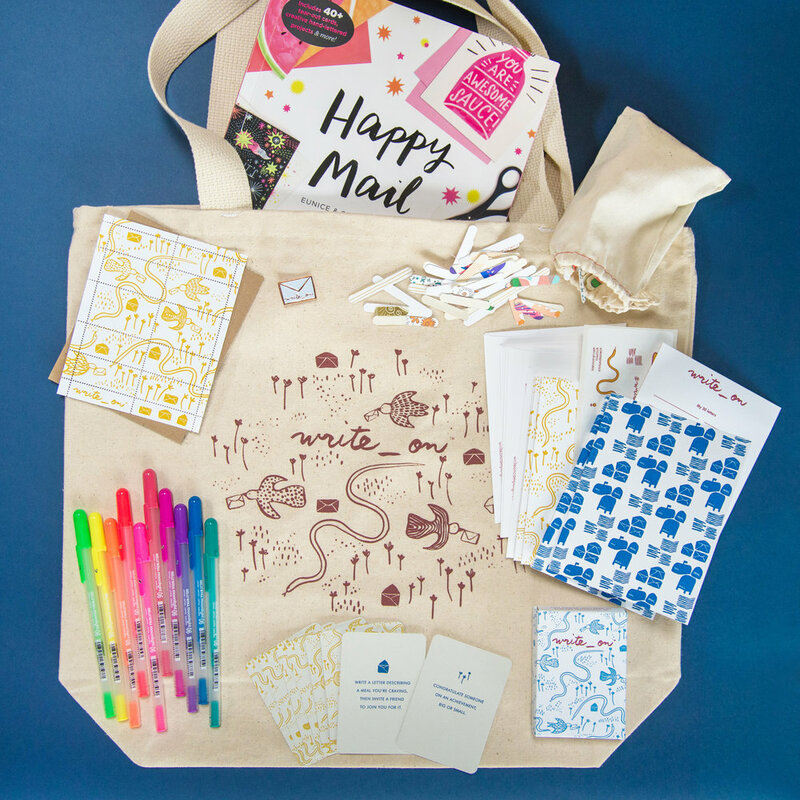 These limited edition starter kits, designed by Egg Press and Hello!Lucky, include six cards and envelopes, one sticker sheet, one challenge log sheet, and one Sakura of America Gelly Roll pen. Get yours today! Want to take your love for letter-writing to the next level? Invite your friends to come over for a letter-writing party! 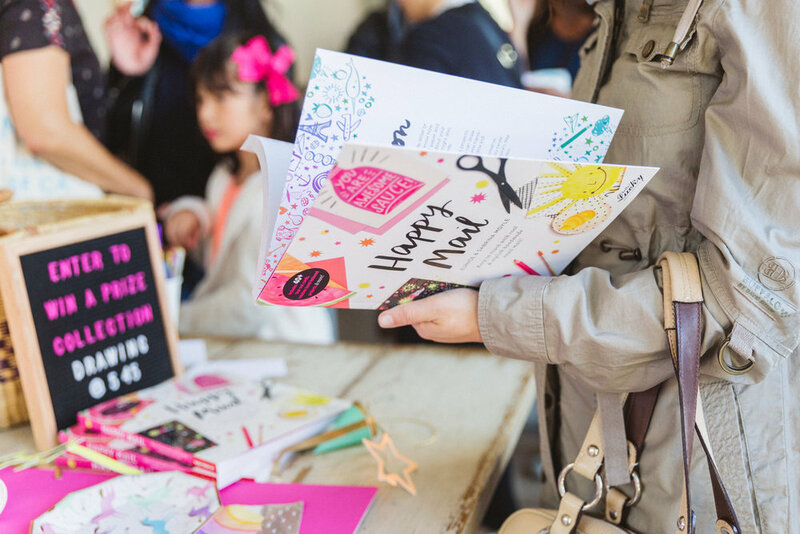 Our Write_On DIY Party Pack gives you all the tools you’ll need for a successful event, it even includes our Happy Mail book! Get yours today! While you’re waiting for the goods to arrive, jump over to our Instagram account for a chance to win a DIY Party Pack. 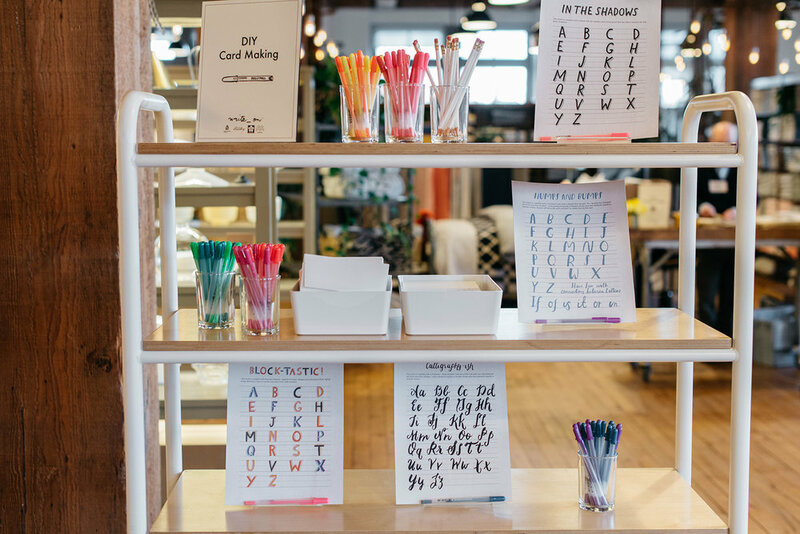 Next, head to our website for our Happy Mail free lettering printables to practice your hand-lettering so you’re all set to put your pen to paper! Follow along with us as we share campaign updates using #Write_On, and visit our new Write_On Facebook group to join the conversation with your fellow letter writers. Stationery and letter-writing isn’t just for adults. It can be a fantastic way to build in more family time with the kids as well. So here are a few tips and tricks on how to use stationery to spend more time as a family. 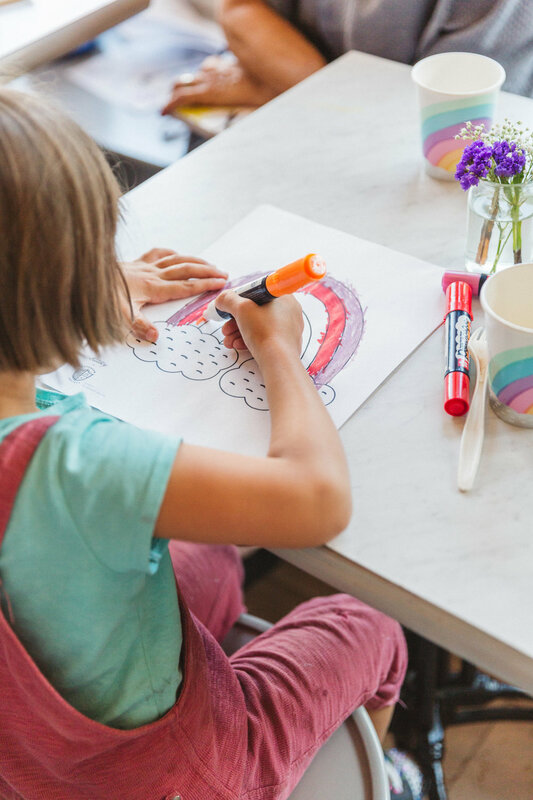 Have a monthly letter writing night to encourage your kids (and yourself!) to reach out to extended family. Write thank you notes for gifts they may have received or write letters to say hello to family you haven’t seen in a while. Setting time aside each month will show your kids just how important keeping in touch with family is, even if you can’t see them all the time. 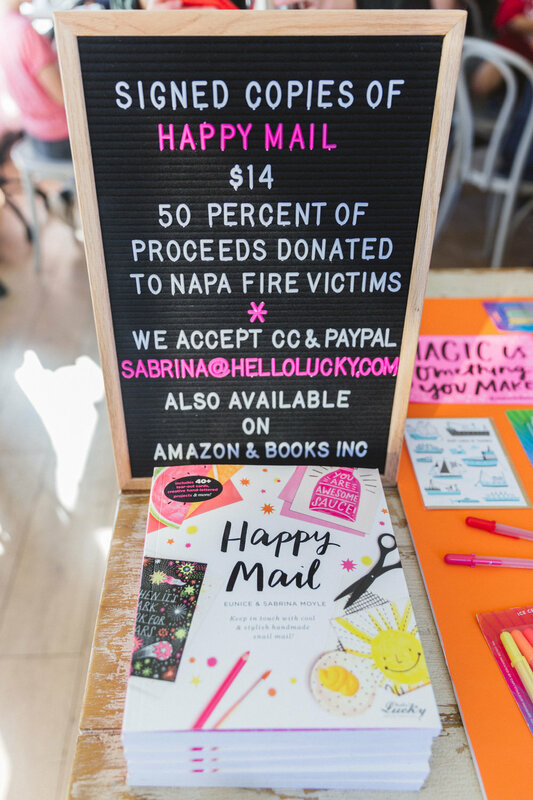 Use Hello!Lucky’s Happy Mail Book to inspire letter-writing craft projects for your family. It’s a great tool for ideas and also includes tons of pre-made postcards. 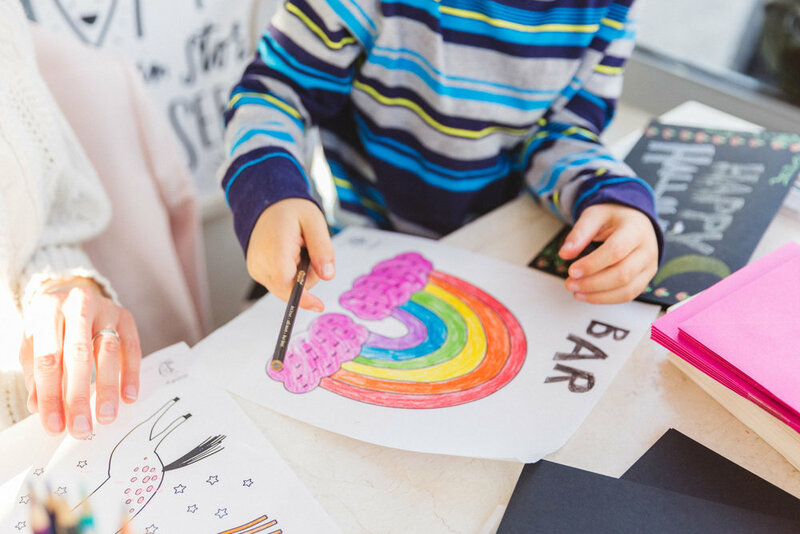 Your kids can follow along with the DIY projects while having a productive creative outlet. Write letters to your future selves. This is a fantastic way to develop writing skills while giving your family a chance to think about the future. Decorate them with doodles, hand lettering, and a few photos of what you all look like now. Then save them to be read at the end of high school, college, or 20 years from now! Use Hello!Lucky’s Be the Change Book to encourage your family to become more aware of social issues. 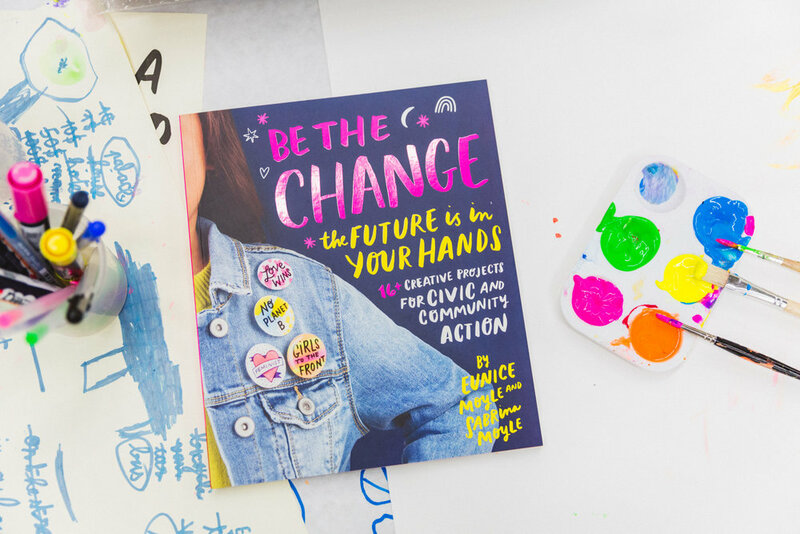 The book includes over 16 different creative projects for civic and community action that you and your family can participate in together. So schedule a family night (or a few!) for letter-writing and craft time to get the creative juices flowing. Your kids will love the activities, and you’ll get some much needed family time. Valentine’s Day always has us thinking about loved ones and the people that matter most in our lives. 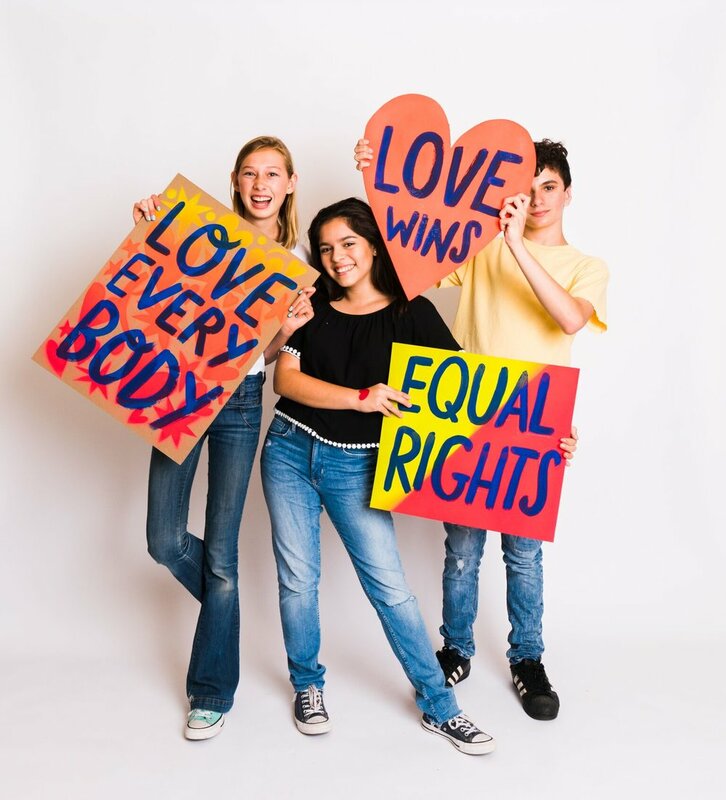 So after you’ve finished sending messages to your parents, significant others, and close friends, here are three people you should also write a letter to today. A teacher from your past that made a big impact on you. Whether they helped you figure out what you want to do in life or helped you get through a tough time, it’ll make their day to get a quick note from you thanking them. A childhood friend you haven't talked to in a while. It’s the perfect time to reach back out to a friend from you past and catch back up. Plus a written letter will mean so much more to them than just a quick Facebook message. An extended family member you may not see very often. It’s so easy to forget about extended family when the holidays are over, but maintaining family relationships is super valuable. So send a hello to an aunt or an uncle and let them know you’re thinking about them. So while you’re enjoying some Valentine’s Day chocolate or just hoping the day will pass quickly, take some time today to write three people you wouldn’t normally consider. 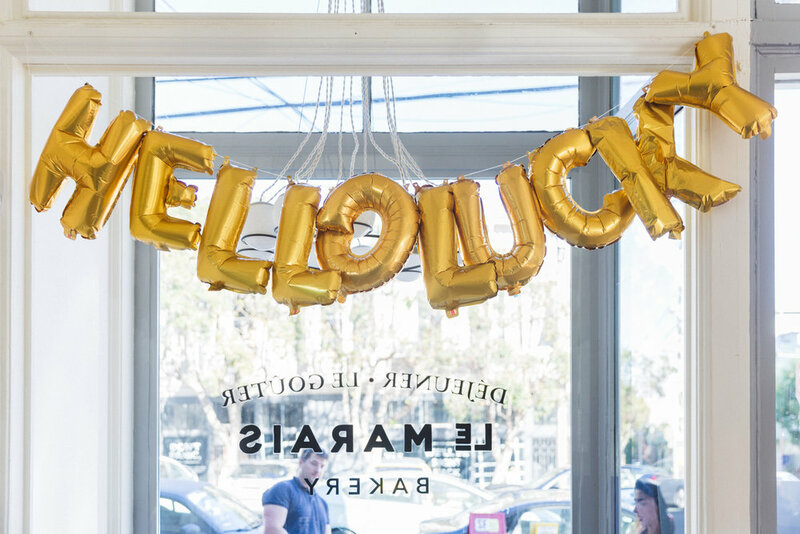 With Valentine’s Day right around the corner, here at Hello!Lucky we’re already thinking about ways to show our friends and family just how much they mean to us. We’re thinking outside of the box this year with five creative ways to show that we care. For a week leading up to Valentine’s Day, cut out little hearts and tape one every day to your children’s, roommate’s, or special someone’s door. Write things you love about them or things you admire. They’re like real life conversation hearts tailored perfectly for the one you love. Send Valentine’s day cards to more than just your sweetheart this year. 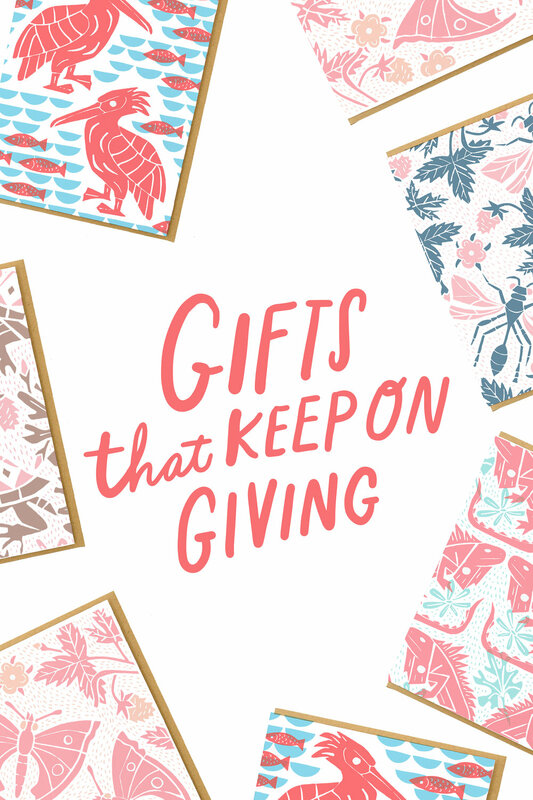 Send them to friends you haven’t seen in lately, relatives, and anyone who could use some extra love this time of year. DIY construction paper Valentine’s like when you were a kid! 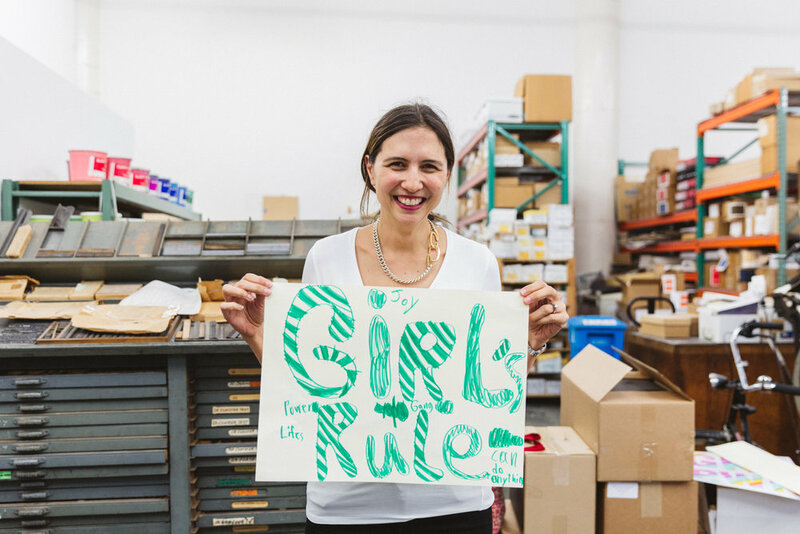 Grab markers, crinkle-cut stickers, glue sticks, and get to crafting! You’ll love to get messy and creative while your loved ones will love the personal touch. Make festive treat jars with mason jars and your special someone’s favorite treat. Decorate it with ribbon and a card saying just how “sweet” they are! Make this Valentine’s Day special with one of these easy, creative ways. You’ll love doing something extra for the holiday, and your family and friends will know just how much they mean to you. PS. 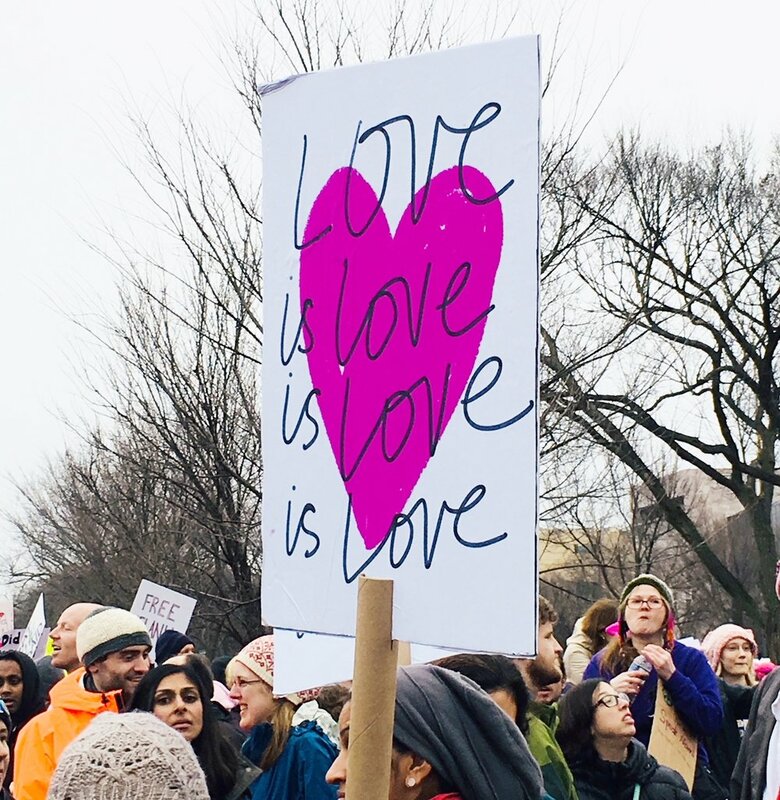 Don't forget to enter our Women's March poster slogan contest! Creative Bug x Happy Mail! 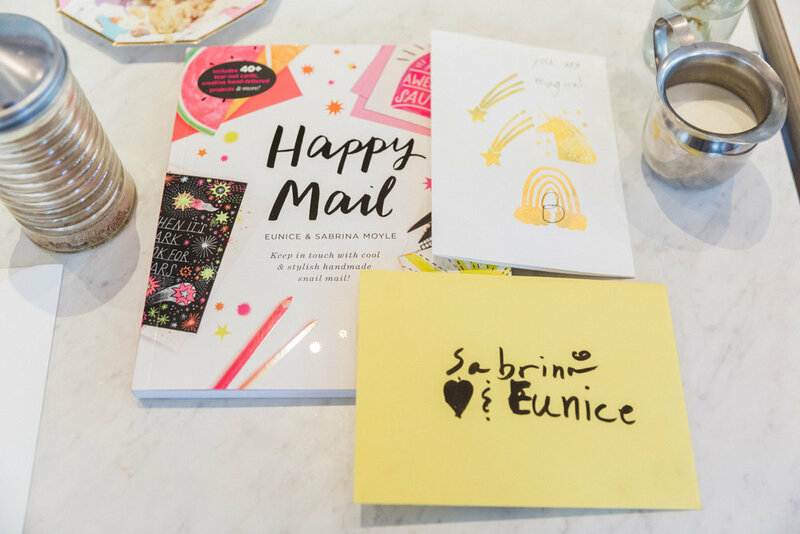 We were live on Facebook with tips and tricks using our favorite tools from our Happy Mail book! 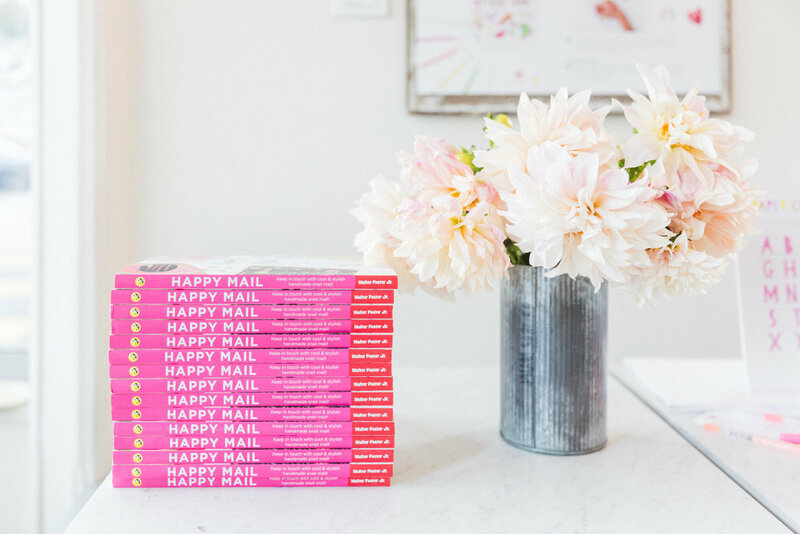 We are SO thankful to our community for the support surrounding our new book, Happy Mail. 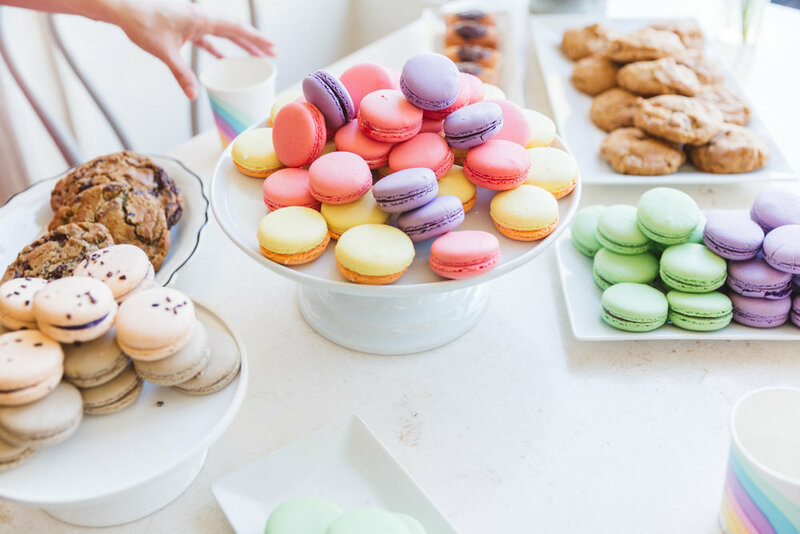 We had a blast celebrating at our favorite San Francisco bakery with new friends and old. We spent the afternoon enjoying delicious French pastries, signing books, and crafting actual projects from it! Special thanks to Sakura of America for providing all our favorite pens, to Le Marais Bakery for providing the space, food, and refreshments, Daydream Society for providing all the beautiful party goods, Zoe Larkin for capturing the magic, and to our publishers Quarto for making it all possible! Photos courtesy of Zoe Larkin. Calling all letter-writers and craft enthusiasts! 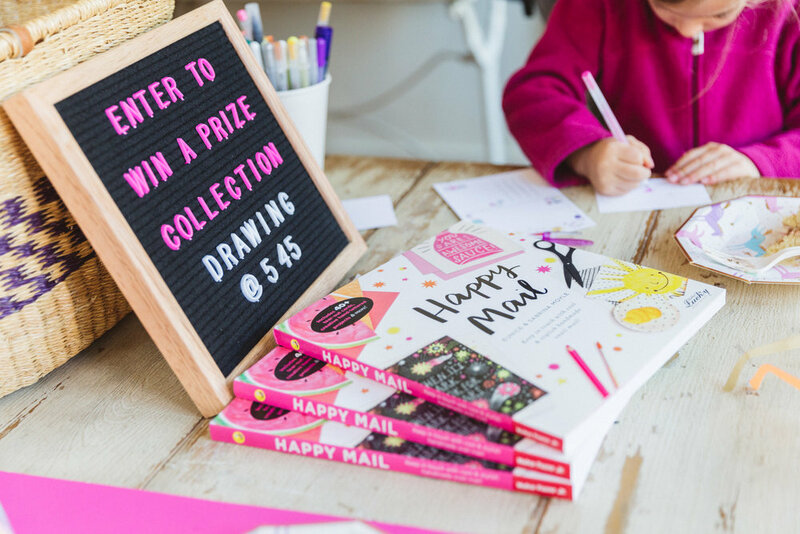 In anticipation of our new book Happy Mail, which comes out in September (pre-order it HERE), we’re hosting a Summer Pen-Pal Competition! Do you want to learn to do some amazing hand-lettering and drawing techniques, make your friends super happy this summer by sending them awesome mail, and get some amazing mail back? If so, this contest is for you! Pick a friend and agree to be pen pals this summer! Trade snail mail addresses and agree on how often you’re going to write. From June - August, write at least 3 letters each -- that’s just one a month! Totally doable. Check our blog all summer for inspiration and ideas! We’ll be posting sneak peeks inspired by Happy Mail showing cool new lettering techniques and card ideas! A little wobbly about your artistic abilities? No worries. We’ll also be offering some free downloads that you can just color in and write on! At the end of the summer, write us a letter or card to us telling us about your summer pen pal adventure! Remember to include a return snail mail address for BOTH pen pals so that we can mail get your prizes to you if you win! Pen pals whose letters we receive by September 1st will be entered into a contest to win a FREE copy of Happy Mail, a STASH of original Hello!Lucky letterpress cards, AND a BUNDLE of Sakura pens. We’ll be picking 3 WINNERS and there might be fun surprises for other pen pals, too! We can’t wait to hear from you! Good luck with your pen pal adventure! P.S. Anyone can participate! We mean anyone! Questions? Email us at info@helloluckycom. We’d love to hear from you! Being a mom is no joke, and tougher than ever these days with more moms working and wearing ALL the hats. Here's a little secret: most moms harbor a nagging feeling they could have done better, so Sunday is the day to let her know that she's done good and to tell her you recognize all her efforts! What do you do if your relationship is a little strained? Focus on the positive. We've all had our share of mama drama, but let's acknowledge that she's always given it her all and appreciate the ways you've grown and learned from her (celebrate the best and forget the rest!). Is she a tiger mom? Let her know you're thankful for everything you learned under her roof (and are still learning!) under her rigorous tutelage. Is she a great listener? Let her know how much you appreciate being able to call her any time, rain or shine. We've pulled one of our favorite projects from our new book, Happy Mail, pre-orders here and here, and coming to a book store near you. Nothing says I love you like a handmade card. For this project, we used one of our favorite tools, the Molotow Marker, to give it an airy feel that’s both polished and personal. Mom will love it! Ideas to try: Floral doodles (Love you mom). Vegetable doodles (Mom, I eat my vegetables!). Anchor doodles (Mom, you’re my anchor). Make your card! Fold a piece of black cardstock in half and using a craft knife, ruler and cutting mat or magazine, cut the card down to 5” x 7”, folded. Draw two parallel horizontal lines in the middle of your card with the Molotow Marker and the write the message along the two lines. No need to be rigid! Let the pen rule you. We encourage free handing it, but you can always draw it first in pencil (draw very lightly so that you can erase the pencil afterwards). Doodle shapes around the type with the Molotow Marker. Allow to dry 5 or 10 minutes. Paint over the entire front of the card with plain water. Using watercolors paint the card. We used two shades of blue to achieve an ombre effect. When the watercolor is almost but not completely dry, put the card under a stack of heavy books to make sure it dries flat. When the card is completely dry, remove the masking fluid by rubbing it with your finger (pro tip: we found that it was faster and cleaner to use a fresh white eraser). With markers (we used two shades of blue that mimicked the colors on the card) doodle a matching pattern on the inside of the envelope, cutting off the pattern along the glue line of the envelope to create the illusion of an envelope liner. Learn how to make more projects like this by ordering the book! The book also includes bonus cards, self-mailing letters, and stickers at the back that are inspired by the projects. What better way to hone in on a letter-writing practice than to make it part of your daily ritual. 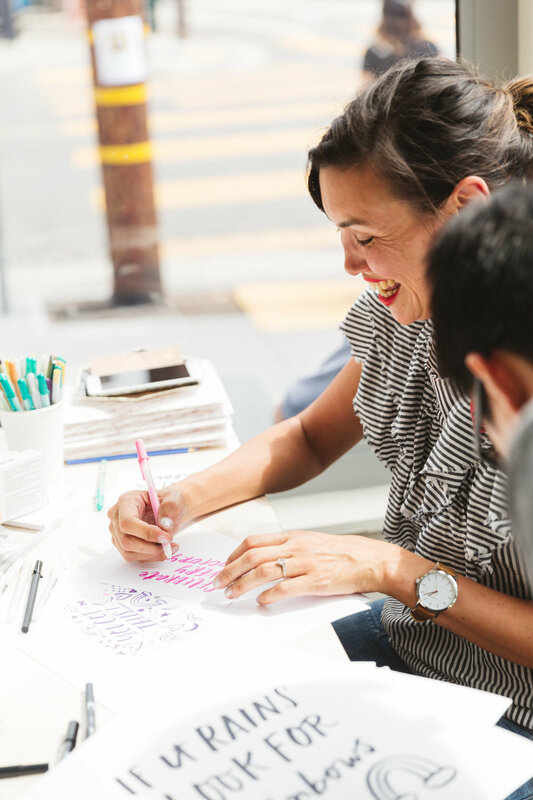 We teamed up with Ritual Coffee, a San Francisco favorite, for a two-part letter-writing party for our Write_On Campaign in conjunction with National Letter-writing month. To really drive home the habit, we’re offering one card from our Write_On kit with every coffee purchase at Ritual Coffee on Haight St. and Valencia St. during the month of April. No excuses! Last night was the first of the two events co-hosted by Ritual Coffee and we were so pleased with the response. We may be biased, but the coffee & card loving crowd might be our favorite! We gathered, we sipped, we wrote, and we’re doing it all over again on Thursday. We hope you’ll join us for our second Write_On event at Ritual Coffee on Valencia St. Thursday April 6th, 6pm-8pm. We’ll be there passing out Write_On Kits and Sakura of America pens, and postage is provided for all your Write_On correspondence! It’s free & there’s no RSVP necessary- So come, bring your friends & address book, and write_on with us. More info here. Special thanks to Ritual Coffee for co-hosting this Write_On event, to everyone who came out, and to our friends at Egg Press, Sakura of America, and Mohawk Paper for making Write_On possible. 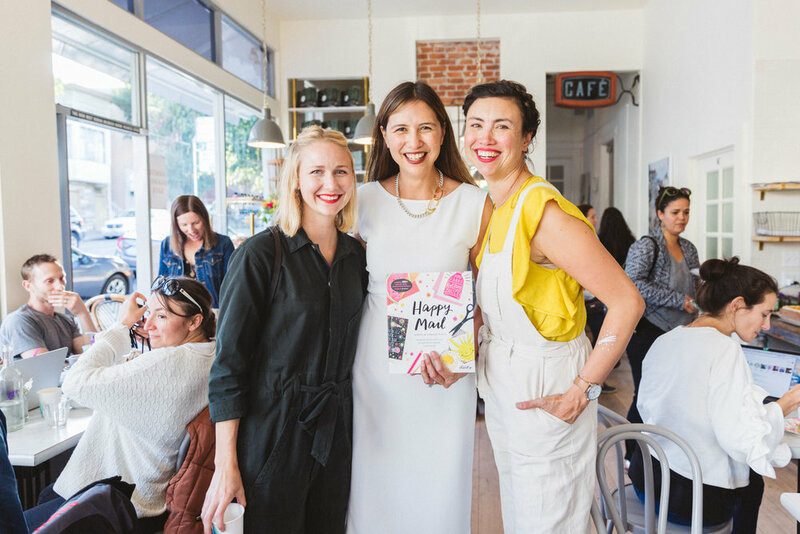 Find out more about our second event at Ritual Coffee on Valencia Street below.